Twynham Sixth Form prides itself on having helped to launch the career of many of our alumni, and our 'Launching Careers' brochure details just some of these. Ricci joined from another school and struggled to settle into work habits in Year 12, but things came good. In his words... "I absolutely loved my time at Twynham! Great, great memories!" Ricci is now working for the United Nations, in an agency called IFAD (International Fund for Agricultural Development). He is a knowledge management and communications consultant for the Environment and Climate Division. The division is working to increase the climate resilience of smallholder farmers in developing countries. Kathy studied nursing and a BSc in Psychology from Cardiff, and an MSc in Neuropsychology from Bristol. She is currently studying for a PhD at UCL. She is a neuronatal nurse and is about to compelte her PhD, looking at deafness in pre-term children. University of Surrey - BA in Creative Music Technology, then an MA in Music (Composition). Jonny finished academia with a clear direction to pursue his career as a music composer for TV and film. 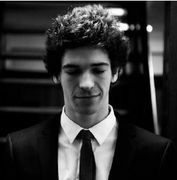 He moved into London to network and find work and has had the pleasure of composing music for HSB, Bentley Motors, McLaren and Rapha. He also wrote music for a TV commercial sponsoring the James Bond move 'Spectre'. Oli completed his CTC Aviation training to commercal level and is now a Senior First Officer for EasyJet in Switzerland. He will shortly be joining BA and the long-haul service, flying the Boeing 747. Living in Chamonix, Oli combines his work as a pilot with a passion for extreme outdoor sports. He is engaged to Lydia Clayton, with whom he was at Twynham School. Adam completed a Business degree at the University of Surrey. He works at J.P.Morgan and has so far travelled to work in London, Zurich and New York, where he is currently a Global Business Manager. Janek completed a degree in Mathematics at Bristol University. He joined Twynham School from Porchester School, following an impressive line of excellent mathematicians from Porchester, and is now an actuary. He is quite the sportsman, completing marathons, triathlons, surfing and mountain walking. Pete completed a Music degree at Southampton University. He now runs his own film production company called Story Culture. It is an Award-Winning Creative Film Agency based in London. They produce videos that tell stories of businesses, brands, people and life. Please click here to see it. Becky completed a Sociology degree at the London School of Economics. Having completed her studies at LSE, Becky secured a place on the Graduate entry programme with EY based in London. She now works as ‘Brand and External Communications Executive’ at the same company. She went on to complete her accountancy qualifications and now works as the Financial manager of the local charity Julia’s House. She is married to Darren and continues to live in Bournemouth. Jordan went to Portsmouth University and completed a degree in Business Enterprise Development. He went on to earn a place on the Rolls Royce Graduate scheme, including a period of time working and training in Germany. He works mainly in marketing and sales and is living in Goodwood. David went to Arts University College, Bournemouth and completed a BA in Commercial Photography. He is now a freelance photographer whose work can be seen here. His work has offered him photoshoots with various football clubs as well as other businesses. He is married to Zulmita (pictured). After A Levels Sebastian worked in the construction industry for 3 years before going into a business partnership setting up a development company in 2010. They are now operating across the Poole Bay area. He is married to Megan (pictured) and they have a young daughter. Studied medicine at Nottingham University. As part of his studies David has undertaken research papers into neurosurgery in relation to the treatment of Parkinson’s disease. His work has gained a lot of interest, leading to presentations in both Oxford and Montreal. He begins his ‘Foundation 1’ in medicine at St George’s Hospital, London shortly. Holly went to Plymouth University to study Geography. She achieved a 2:1 (Hons) degree and then secured a place on the N Power Graduate Scheme. As part of the scheme Holly has been in Dortmund, Germany for the last 6 months. Holly decided to email the CEO of the Parent Company, Innogy, asking if she could meet him for lunch as she had enjoyed the graduate programme and she wanted to tell him about it. He agreed and invited 5 other graduates from all over Europe to join them for lunch. Holly is the third person from the right in the photo. Sean Harford became National Director, Education in September 2015. Sean was appointed Her Majesty’s Inspector in 2003. Since joining Ofsted he has worked in school improvement, school inspection policy and organisational restructuring. His previous post in Ofsted was National Director, Schools. Jon went to Staffordshire University to study geography and outdoor education. His love for the mountains was birthed on the Snowdon geography field trip in Year 10. Jon returned three times as a mountain guide on the trip and was a real inspiration to the students. During his degree Jon studied glaciation and fell in love with the landscape. Following his degree, Jon moved to New Zealand to work as a glacier guide on the Franz Josef glacier and then progressed to running the operation. He has recently been appointed to the field training team at the Antarctic Survey, Antarctica. Jon will be working with the scientists, offering technical support and safety. Since 2008 Pete has been working for the YMCA in the USA. He is currently Director of Educational Programs in the Greater Boston area, New Hampshire and oversees 18 YMCA facilities. When in Year 13 Pete organised the Sixth Form to sing at a farewell to the Head Teacher, Brian Driver, who was moving to Hong Kong. Always willing to push the boundaries they sang ‘Always look on the bright side of life’, from the film ‘Life of Brian’, with their own adapted lyrics which fitted the recent life history for Brian Driver! Pete’s twin sister Victoria is also now living in the USA. From 2002 – 2008 she was the USA Distributor Co-ordinator for Sunseeker International. Now based in Rye, New York, Victoria is a professional squash player, with her highest ranking being no. 225 in the world squash rankings for women (2012). She has experienced more success in the mixed doubles, as she and her playing partner were the 2015 U.S. Mixed Doubles champions. When not playing Victoria works as a private squash coach. She married in 2014.